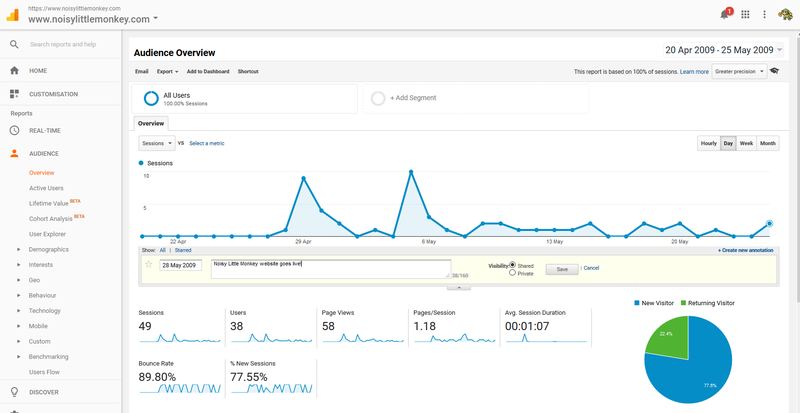 To annotate your marketing activity in Google Analytics, all you need to do is login to your account and look for the little arrow directly beneath the graph on that first Overview page. Next, you’ll want to casually saunter over to the “+ Create new annotation” link. Set the date and add a descriptive note so that Barry from Marketing can work out what’s going on, without you having to explain it AGAIN THIS IS THE THIRD TIME NOW BARRY. Hit Save and allow yourself a contented sigh, warm in the knowledge that no matter what you just did… your arse is now covered. You’re welcome, arse.